Maryland, or Terra Mariae in Latin, was named for Queen Henrietta Maria, wife of King Charles I of England. 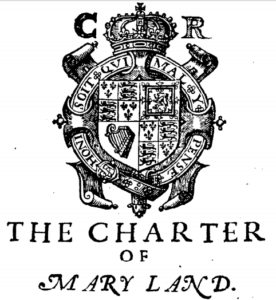 Charles I granted the Maryland Charter to Cecilius Calvert, 2nd Lord Baltimore, in 1632. His father, George Calvert, 1st Lord Baltimore, had long pleaded for the charter but died shortly before it was granted. The first settlers arrived in Maryland two years after the charter was granted, in 1634. Cecilius Calvert led the expedition. His brother Leonard would become the first Governor of Maryland. Why was Maryland named for Henrietta Maria? Henrietta Maria was not just any queen—she was a Frenchwoman and a Catholic in Protestant England. She married 24-year-old Charles, then Prince of Wales, at the age of 15. Her religion figured prominently during her time on the throne, and explains why Maryland was named for her. Ostensibly, the marriage between Charles and Henrietta Maria sought to ally England with France and against Spain. However, the thought of a Catholic-Protestant couple ascending to the English throne concerned members of the English parliament. Their concern reflected a sharp divide in seventeenth-century Christianity in England, and foreshadowed a greater civil conflict that would cost Charles the throne, and his life. Henrietta Maria became Queen of England when Charles ascended to the throne in 1625. Their early years were marked by political turmoil and estrangement, but over time their relationship grew closer. To the dismay of Englishmen suspicious of Catholic influence, Charles allowed Henrietta to practice Catholicism openly and preferred ritualistic High Anglican services himself. Some suspected a papal conspiracy. 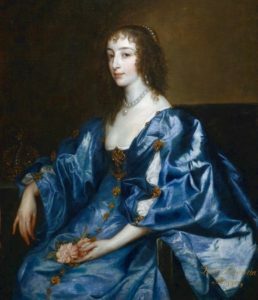 In the same year Henrietta Maria became queen, George Calvert, a member of the English House of Commons, declared his Catholicism. The admission assured his departure from the House of Commons, but he was named Baron Baltimore in the Irish peerage and was granted a large estate in Ireland. Beginning in the early 1620s, Calvert funded the establishment of a settlement in Newfoundland. When he visited the settlement in 1627, other colonists complained about his Catholic practices and accompanying priests. The weather was equally inhospitable. Looking for a more temperate geographic and religious climate, Calvert petitioned King Charles I for land in the Chesapeake Bay area. His Catholicism prevented his settlement in Virginia. He continued to plead with the English monarch for a cession but, nearing his goal, died. His son Cecilius completed his father’s mission two months after his death in June 1632, and, appropriately, the new colony, Terra Mariae, took the name of the most prominent Catholic in all of England, Henrietta Maria.